Dr. Bingham-Lester brings durable, natural-looking solutions to patients in the Crofton, MD area. Dental amalgam is a silver-colored compound that contains mercury. Dr. Bingham-Lester does not use amalgam. She works with each patient to select the most appropriate material for dental fillings. Gambrills patients have a range of strong, safe options. Composite resin is made of plastic combined with finely ground glass for translucency to match dental enamel. Composites are strong enough even for back teeth fillings in Gambrills. They conserve tooth structure, and there is little risk of the filling causing fractures in the tooth. Dr. Bingham-Lester uses a system that sends ultrasonic vibrations into the viscous composite, allowing the material to quickly settle into the prepared tooth. You don’t feel the vibration, but your filling appointment is shorter and your experience is more comfortable. Dental bonding is a tooth-colored resin that is adhered to the tooth with a light-activated curing process. Dr. Bingham-Lester uses bonding for cosmetic enhancement – to disguise discoloration or a chipped tooth, to re-contour a poorly shaped tooth, or to close small gaps. In Dr. Bingham-Lester experienced hands, you can be sure the material and placement method for your filling is right for your lifestyle. Dr. Bingham-Lester also works with inlays and onlays that provide additional strength in case of severe tooth decay. Gambrills patients can receive these ceramic restorations in one visit, because our office is equipped with CEREC® technology. Each patient and every filling is different. Dr. Bingham-Lester takes into consideration the tooth being treated, your eating habits, whether you are a bruxer (you clench and grind excessively), use of tobacco, your budget, and time constraints. 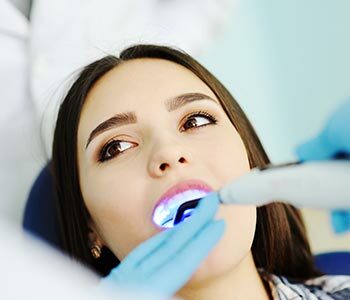 In her experienced hands, you can be sure the material and placement method for your filling is right for your lifestyle. Call Bingham-Lester Dentistry at 410-885-6522 to schedule an appointment. Jerome E "I had a crown replaced; but prior to my crown replacement I had to have a root canal, which I chose to have done at a different dentist (prior relationship established). Dr. Bingham-Lester did a great job replacing my crown; my crown was made while I waited, and the whole process only took a couple hours"